1. Painting Over Toenail Fungus. We can all agree nail art looks pretty spiffy, but it can be disastrous if people simply try to “cover up” their foot fungus with nail polish. Yes, the yellowed nails are unsightly, but the Foot Health Network warns that wearing nail polish will “seal in fungus and allow it to grow.” Furthermore, the Detroit Foot Pain blog adds that wearing toenail polish too often can deprive the nail of oxygen and create damage to the nail that invites fungus to grow. 3. Trusting Over-The-Counter Topical Creams. Over-the-counter creams appeal to consumers because they can be purchased without visiting a doctor and they are relatively cheap. However, Web MD reports: “They do not work as well as oral medicine in curing fungal nail infections.” One review of research found that ciclopirox cream only killed fungi in 30% of people who used it. The use of these creams is mainly to help prevent reinfection after the fungus has been cured using oral medication or laser treatment. 4. Digging and Picking at it. 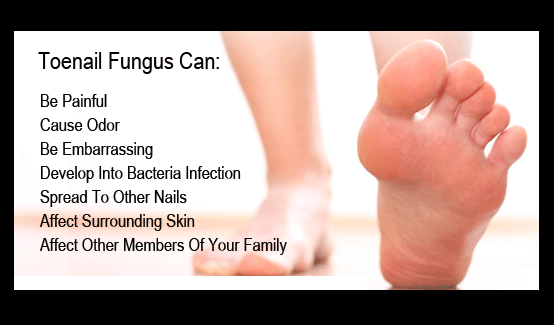 Some people try to file away at the crumbly edges or dig under the nail plate in an attempt to “scrape away the fungus.” Quite the contrary, this activity stirs up the fungal spores and leads to infections on the other toenails and even the fingernails. It is important that you avoid sharing clippers or scissors with anyone else during this time. 5. Covering Up Too Much — Or Not At All. 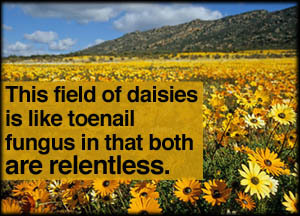 While going through toenail fungus treatment, there is a time and place for everything. One mistake people make is to cover the feet constantly. Maybe they just don’t want to look at it; but keeping the feet inside socks and shoes from dawn til dusk can prevent the feet from breathing — and therefore, delay recovery. Moist socks and contaminated shoes are a frequent cause of toenail fungus infections, so it’s important to keep the feet clean and the shoes sanitized. Let the feet breathe in open-toe shoes when you are at home. On the other hand, you want to keep your feet covered with water shoes whenever you are in a public bath house, beach, swimming pool area, hotel shower, or locker room to avoid spreading the fungus to others. Fungal nail infections are common in adults. They often follow fungal infection of the feet. Infections occur more often in toenails than in fingernails. I think these natural remedies will be very effective. Nail fungus is difficult to cure but many people have luck with a variety of home remedies. There are several ways to treat nail fungus growth and problems with natural and herbal remedies. When my cousin had fungal nails she used some kind of soak to get rid of it until she could get legitimate treatment.